Hey, there's a lot of time to kill over a guys' weekend away from our families. On the 75-minute drive last Friday from Cincinnati to Keeneland Race Course with @RedRockOrBust, trainer D. Wayne Lucas came up as one of our far-flung subjects of discussion. You know, the type of exchanges you'll never hear at the dinner table or on the long, daily train or bus ride commute from work. Anyway, horse racing was the center of most discussion, considering our plans for two straight days at the illustrious Lexington, KY, track and a visit to the Thoroughbred Center. I had noticed in preparation for last Saturday's NHC qualification tournament on HorseTourneys.com that the Hall of Fame trainer with 14 lifetime Triple Crown wins -- Oxbow, the last, at 15-1 in the 2013 Preakness -- entered a few horses at Keeneland over the weekend. Our discussion speculated on his motivations at age 82 after an immensely accomplished career, as well as those of owners who hire trainers (and there are few in the octogenarian ranks)...not to mention why tournament players like us would jump to play his runners. The latter, especially so, considering Lukas' mere 2-for-90 in stakes tries since 2017 and that he's not winning at nearly the breakneck pace of his glory days of the 1980-90s. Yet as fate would have it, Lukas' 23-1 Warrior's Club -- the second-longest shot in the nine-horse Grade 3 Commonwealth Stakes -- was the key to my earliest qualification ever to the NTRA National Horseplayers Championship. I've earned my way into the 19th-annual NHC next February in Las Vegas, largely courtesy of Warrior's Club, but also 10-to-1 winner Spiced Perfection in the Evening Jewel Stakes at Santa Anita just 12 minutes after, and two short-priced favorites in the later stages of my contest. My third-place HorseTourneys.com finish among 219 entries was good enough to get a shot at the $3 million NHC 19 and to put to rest any concerns about missing out for a third-straight year after qualifying for NHC 15 and 16. 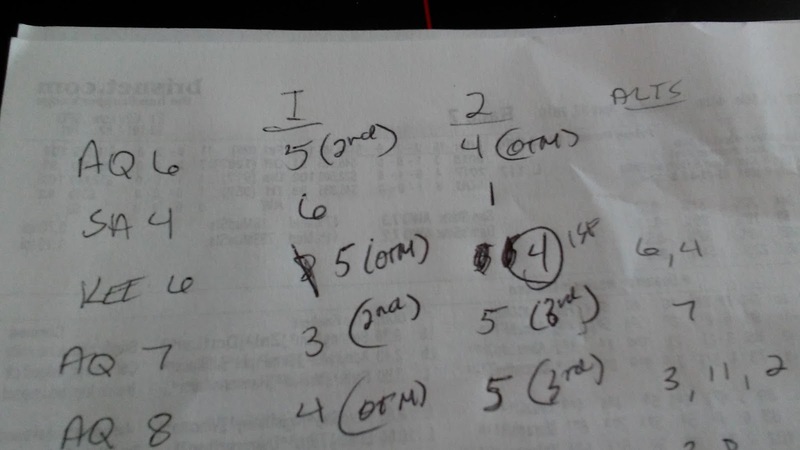 The funny part is that Warrior's Club was merely an alternate contest selection after 15-1 Shut the Box, my top pick and a key in my contest preparation, was a pre-race scratch. Yet, I had to make Warrior's Club a main contest play after subconsciously punching him as a single in the final leg of my separate Pick 3 ticket -- one that was worth $497 if he miraculously won the race. In all honesty, I intended to use another horse -- one that ultimately did not hit the board in the Commonwealth Stakes. My contest card proves that, as I used Conquest Windycity in one of my two tournament plays. Instead, Warrior's Club got a perfect trip under jockey Luis Contreras to pay $48.80 to win (capped at $42 for contest purposes). Not too shabby. The next (of 12) contest races vaulted me to the top of the leader board, as Spiced Perfection edged out vulnerable 2-to-5 favorite Show It N Moe It to win the Evening Jewel three time zones away. The combined $29.60 of win and place earnings proved powerful, as several shorter-priced horses for the duration of the HorseTourneys.com contest made it difficult for people to make up ground. Among them were two that I had, including 3-to-10 Monomoy Girl in the Grade 1 Ashland Stakes at Keeneland and 9-to-10 Justify in the Grade 1 Santa Anita Derby, a key Kentucky Derby prep. Combined, those two winners provided me just $10.70 of winnings, but that proved enough to stave off the competition and lock up an NHC 19 berth. NHC 19 is still almost a full year away. You may recall that my last post assessed the new NHC Tour points accrual structure and how it favors high-volume players. Contemplating what I should do now that my NHC spot is assured, yet 10 months from now, I'll revisit that theme next time around. A deeper reading of the rules structure uncovered some interesting opportunities, even for the weekend player like me who generally lacks the volume of play as full-timers on the NHC circuit. Hey, Bill, great read. Congrats on the early Qualify!